Meet the Surge S1 octa-core mobile processor. After wowing the crowd with the gorgeous Mi MIX last October, Xiaomi is now back with a more humble phone but with a twist. The new Mi 5c is the first smartphone to carry Xiaomi's very own chipset, the octa-core Surge S1, and it's hitting the Chinese mid-range market with a price of 1,499 yuan or about $220 on March 3rd. Much like its earlier variants, the Mi 5c features a 5.15-inch 1080p display with 94.4-percent NTSC gamut and 550 nit brightness. It comes with 3GB of LPDDR3 RAM plus 64GB of eMMC 5.0 storage, along with a front-facing fingerprint reader, dual-Nano SIM slots and China Mobile radio with VoLTE support. Thanks to the new chip's lower power consumption, the Mi 5c went with a smaller 2,860 mAh battery, thus achieving a slimmer metallic body at just 7.09mm thick in return. Should you find yourself running low on juice, the 9V/2A quick charge support will come in handy. As for photography, the 12-megapixel f/2.2 main camera features an unnamed sensor with 1.25um pixels, which is larger than the common 1.12um offerings on many recent phones but will no doubt be hindered by that slower aperture; not to mention the lack of optical stabilization as well. The front camera, however, should be a safe bet with its 8-megapixel resolution plus a nice f/2.0 aperture. But enough about the phone. 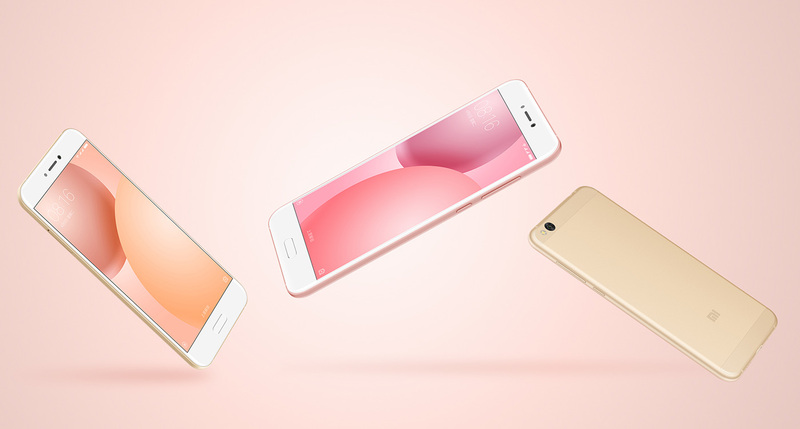 The Surge S1 chipset had been an ongoing project since Xiaomi subsidiary Pinecone's establishment on October 16th, 2014. According to Xiaomi CEO Lei Jun, Pinecone finished its first chip design on July 25th the following year, and it received the first sample chip on September 19th. Then on the 24th, his team made the first phone call using the chip's modem, followed by a successful screen boot-up two nights later. Even with financial aid from the local government, it wasn't until 17 months later i.e. today when the chip is finally good to go. Given the timeline, it's no surprise that the Surge S1 is still based on TSMC's 28nm HPC+ process (as opposed to something more recent, such as 16nm or the very new 10nm), but one has to start somewhere. Its processor consists of eight battery-friendly Cortex-A53 cores, four of which are clocked at 2.2GHz and the other four at 1.4GHz. For graphics, there's a Mali-T860 MP4 GPU which is good enough for the average game. Simply put, don't expect the Surge S1 to match the performance of other high-end chips; it's closer to the likes of Qualcomm's Snapdragon 625 and MediaTek's Helio P20. 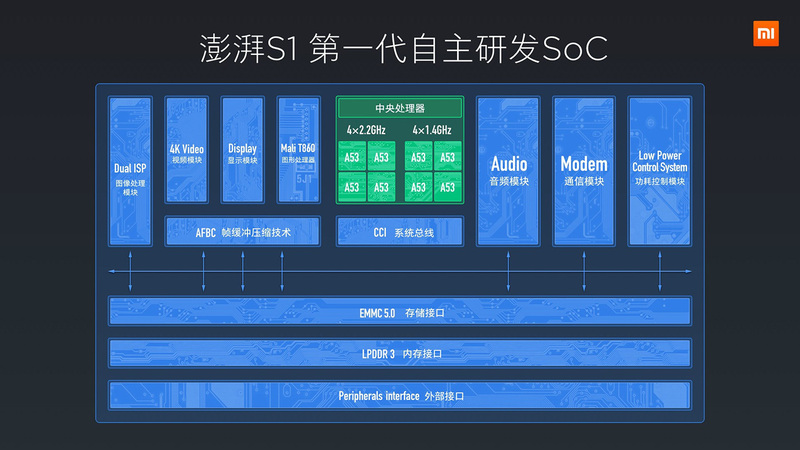 While the Surge S1 only has China Mobile radio at the moment, Xiaomi should still pose as a serious threat to other chip makers in the developing markets. MediaTek in particular will be the biggest loser, should Xiaomi choose to cut out the middle man and drop MediaTek entirely for its popular Redmi devices in the future. And of course, it's only a matter of time before Xiaomi catches up with the competition with better processes and modems.